Many of the trails in The Gatineau Park can be challenging for people who are new to cross-country, and this applies to some of the so-called easy (green) trails. The Park is located in the Gatineau Hills, and hills is exactly what you'll find on most of the ski trails. The added effort and skills required to ski up and down these hills may even come as a surprise to experienced cross-country skiers who are used to relatively flat terrain. But don't despair, if you start off with the easier trails, and work your way up, you should soon feel right at home cross-country skiing in the Gatineau Park. The maps on this web site use a colour scheme to indicate the difficulties of the various trails in the Park. They are based entirely on the colour scheme used in the cross-country ski trail map of the Gatineau Park published by the National Capital Commission (NCC). The easiest trails are represented by a green line, the more difficult trails are represented by blue lines, and the most difficult are shown in red. This should only be taken as guidelines, and not as absolute categories. For example, some of the more challenging green trails can be almost as difficult as some blue trails. Note that the signs with the trail number in the Park also give an indication of how the trails are classified. The easy trails (represented by green line on the map) have signs with numbers in green circles. The more difficult trails (blue) have signs with the number in a blue square. The most difficult trails (red) have signs with numbers in a black diamond. The lines on the maps also represent three types of cross-country skiing which takes place in the Gatineau Park. These are classic-skiing, skate-skiing, and back-country skiing. Needless to say, skate-skiing resembles skating, and it requires greater physical effort, more technique, specialized skis, and wider trails. Generally, it only possible to skate ski on the shared trails, which are wide enough to accommodate both classic and skate-skiers. These wider trails are groomed regularly and tend to be made on what are roads or laneways during the summer. These are represented by the solid lines on the map. Trails represented by a broken line are for classic cross-country skiing only. Although these trails are also groomed, they are quite a bit narrower than the shared trails. They tend to go through forested areas, and the majority are probably hiking trails during the summer. Trails represented by a dotted line are for back-country skiing. These trails are classic cross-country skiing, but only received a minimum of grooming. The tracks you find on these trails were probably made by the previous skier, and not a grooming machine. These trails tend to be narrow and more demanding. Note that the style of lines used to represent the different types of trails on this web site are based entirely on the NCC map. The starting points and destinations described on this web site are set arbitrarily, but many are based on routes that are very popular with recreational skiers out for an afternoon ski in the Park. Since almost everyone has to drive to get to The Gatineau Park, the routes start and end at one of the numbered parking lots (indicated by P1, P2, P3 and so on). The destination is usually a cabin or point of interest. There are eight day-use cabins serving the network of cross-country trails in the Gatineau Park. The largest and most popular are Keogan, Huron, and Herridge. They are open to cross-country skiers on a first come, first serve basis (and can get quite crowded on nice winter afternoons on weekends). Some have solar panels to power emergency communications. Otherwise, they have no electricity or lights. 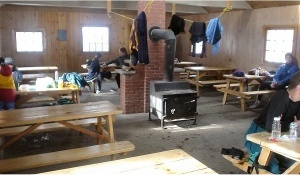 They are heated with a wood stove, which is usually kept going by the skiers using the cabin. They are sparsely furnished with picnic tables that vary in size. There can be over a dozen tables in some of the larger cabins, while others only have a handful. There are outhouse toilet facilities in the vicinity of most cabins. People are not allowed to overnight in these cabins. Note that there are a number of cabins (and 2 Yurt tents) in the Gatineau Park which are specifically designated for overnight use. These are mainly in the area around Lac Philippe. They are equipped with bunk beds and depending on the facility, can accommodate 6 to 10 people. There is a fee for using the overnight facilities and reservations are required. Click here for more information about the use of the overnight cabins. Cross-country skiing in the Gatineau Park is not free. A daily adult pass cost $9.90 (as of 2006). On most trails the fee is collected through an honour system. At the beginning of the trails at the parking lots, there is a small metal box in which you deposit the money. You then take a pass from and an adjoining box and attach it to your jacket. During the popular hours on weekends, there will usually be an attendant at the beginning of the trails to verify that you have a pass. Yearly passes are also available from the NCC. For a single adult, they cost $108.95 when purchased before December 18, $128.75 afterwards (as of 2006). There are different fee structures for seniors, students and families (it's free for children under 12). For more information, call the park visitor center at 819-827-2020 or 1-800-465-1867, or see the NCC web site. It should be noted that unlike so many of the user fees imposed on citizens by the federal government during the past two decades, cross-country skiers do get a real value-added-service for the money they pay to use the Park (although the $10 daily fee would seem to be the upper limit of what can be reasonably charged). The NCC web site explains that the snow on trails is manually and mechanically compacted, levelled, reconditioned, and groomed throughout the winter. There are approximately 100 kilometres of main trails that are generally groomed four times a week. There is approximately 90 kilometres of secondary trails which are groomed once or twice a week. Anyone planning to do a lot a cross-country skiing in the Gatineau Park should get the NCC map of the cross-country ski trails in the park. Unlike the maps on this web site, the NCC maps show all the trails and contain much more detailed information. For example, they show the elevations (contour lines) which allow you to get an idea of the hills you will encounter on a given trail. They can also be a safety item if you ever get lost exploring trails off the beaten track. A paper version of the map is available for $4.95, while a waterproof (plasticized) version costs $9.95 (prices in 2006). They can be purchased at some of the local stores which cater to cross-country skiers, the Park Visitor Centre at 33 Scott Road in Chelsea, or at the NCC Information Center in downtown Ottawa at 90 Wellington Street (opposite the Parliament Buildings). The NCC web site gives daily reports on ski conditions in the Gatineau Park (click here to check it out). The site also gives the recommended kick wax. On weekends, there is usually a report posted early in the morning, followed by an update just before noon (and there is often a change in the recommended wax between the two reports). When consulting these reports, it is a good idea to pay attention to which trails have been groomed within the last 24 or 48 hours. If you can't access your computer, phone 819-827-2020 for a recorded message about the ski conditions. If you are just learning to cross-country ski, you may want to practice a few times on the NCC Greenbelt trails, which tend to be flatter than those in the Gatineau Park. When you first come to the park, start off with the easier and flatter trails. But there are very few trails (if any) in the Gatineau Park that don't have some hills. When you are skiing on a downward slope and see that groomed tracks disappear, it's a sure sign that you should start snow plowing to avoid going down a hill too fast. Also remember that the tracks on hills can become very slick and fast under certain temperature conditions or after a day of heavy use. When this happens, you may want to begin snow plowing earlier than later. If you do encounter a hill that is beyond your comfort level, you may want to take off your skis and walk up or down the hill. When doing so, stay off the trail (stay to the side, where there is no chance you'll damage the trail). When you stop for a rest or to talk with friends, please get off the track. Remember that on shared trails, the center portion is used by skate-skiers, so it is best to go to the side of the trail. Many skiers only have limited control or limited options when coming down a fast steep hill. It is therefore important for people to yield to skiers coming down a hill. Skiing in the Gatineau Park often means you'll be out for at least a half day. If you aren't in the habit of doing so, you may want to bring a small packsack or hip sack with some drinking water, snacks to replenish your energy, any extra clothing that might be needed, a map of the park, and various kick (grip) waxes. It's usually a good idea to bring the recommended wax as well as waxes suitable for the neighbouring temperature zones.